Part of a lawn of SCP-355, prior to immolation. Special Containment Procedures: All specimens of SCP-355 are to be kept in a 5 metre by 5 metre plot of ground in a small terrarium in Site 19 and watered daily. This section is to be kept with minimal air movement to prevent accidental release of seeds, and provided with Standard Atmospheric Mixture #14. Dim, red light is to be maintained in the room. Access to the room is to be granted by Dr. Fieswell, and tests are to be performed under his supervision. All visitors are required to wear a thick-soled environment suit for the duration of the visit. The entrance to the room is to be secured with an airlock and fan system to prevent the accidental release of seeds. Description: SCP-355 is an unknown species indistinguishable to the naked eye from ordinary grass, but its nearest known genetic relation is the mahogany taxon. A hollow core of cellulose and buckminsterfullerene runs through the center of each blade to maintain the grass' vertical structure, and each vein in the leaf is sheathed in a similar core, resulting in an unusually inflexible grass, sharp enough on the outside to pierce light wood and some plastics. The main blade performs photosynthesis and absorbs atmospheric nutrients as usual. Root structure is unusually deep for a short plant, but otherwise normal. However, the species seems to have developed in a low-energy environment, as photosynthetic rates under standard Earth atmospheric conditions are inordinately high and accelerate the species' reproductive cycle, causing rapid generation and dispersal of grass seed (each cycle occurring approximately once every two weeks). This hypothesis is supported by the passive carnivorism, similar to that of the sundew or cobra lily (also from environments low in nutrition). Any creature with insufficiently armored feet that treads on the grass suffers the penetration of their feet by the dense blades, a light liquefying acid, and subsequent drainage of bodily fluids through the hollow core. The plant simultaneously deploys sharp splinters from its edges in reaction to the sudden pressure, making it difficult for the victim to move away; attempts to do so usually result in pulling the leaf from its root structure, resulting in continued siphoning through the severed stem, or at least severe lacerations to the feet. In order to maintain the species in its containment chamber, the light has been dimmed to levels that prevent atypical growth patterns, and the atmosphere has been appropriately saturated with the necessary nutrients for proper development. SCP-355 was first discovered by accident following the invasion of a storage facility used by the Chaos Insurgency in █████████, Alberta, disguised as an ordinary if moderately secluded local residence. 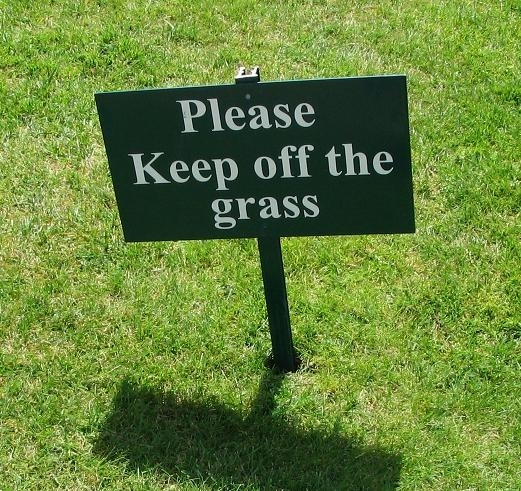 During the post-combat evaluations, several casualties were left unaccounted for until discovered on the front lawn, drained of their fluids and being slowly digested, near a wooden sign clearly labeled "Please keep off the grass". The area covered by the plant was determined by the scattering of meat chunks, and a plot of ground was removed for study before the eradication of the remaining area. In this and subsequent encounters with Chaos Insurgency installations, SCP-355 has been successfully destroyed by oxygen poisoning, heavy flame, anti-organic acids, and, in one instance, a variety of commandeered domestic ungulates. SCP-355 seems to be negligibly affected by poisons including [DATA EXPUNGED], in the form of tainted meat, vaporous herbicides, or soil toxification. Memo: SCP-355 was not among the SCPs stolen from the Foundation during its schism with the Chaos Insurgency and was therefore acquired by them sometime after. Its origin is unknown, although documents seized during [REDACTED] suggest it may have been one of several objects deposited by SCP-CI-103.